Maggie Rothschild operates her business, Rothschild Worldwide Licensing, out of her home in Sherman Oaks, California. The company sells hundreds of thousands of novelty items to sports teams and retail stores per year. 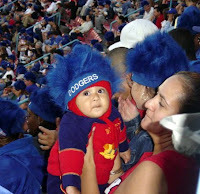 Items like blue colored wigs for the Los Angeles Dodgers, and other mascot toys. For 24 years, Maggie ran a children’s clothing showroom. In 1999 she created the Millennium Bear, a stuffed animal that counted down the minutes to the year 2000. The toy sold well, but she realized this product couldn’t be manufactured again for another one thousand years, so she didn’t have high hopes for the future. Then one day the LA Dodgers called her and asked her if she could design some novelty blue wigs to be sold in their retail shops. She didn’t think she was the woman for the job, as she hadn’t any experience with wearing or designing wigs. However, she started to dig through catalogs and contacted several designers. Soon she had all six hundred blue Dodgers wigs. The wigs sold out almost immediately. Then orders came in from other teams who wanted wigs in their team colors. These wigs are given out at games and are also sold by retailers. Maggie’s product line has also grown to include Rally Monkeys, plush toys and stadium cushions. Her client list not only includes the Major League Baseball, but the NBA, the NHL, and the NCAA. Sales last year were over $1.5 million, and she expects sales this year to double. Currently she is working on a new product line as well – jumbo mascot puppet heads. Who knows – could replace the giant foam fingers worn at games.